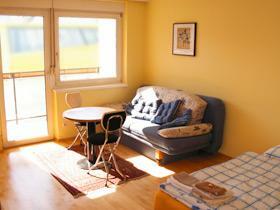 3BR apartment overlooking Vienna. Modern elevator building. View to the Viennese mountain Leopoldsberg. It is comfortably furnished and can be occupied by up to six persons. The flat consists of 1 living room, 3 bedrooms, kitchen, 2 bathrooms,2 WC, balcony and the anteroom. If you arriving by car we can provide you with our garage upon request.